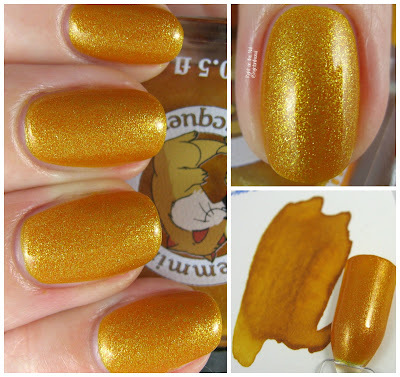 Right on the Nail: Nibs & Nails Presents Lemming Lacquer Pools of Golden Sand (Inspired by Diamine Ink): Swatches and Giveaway! My Favorite Polish of 2016 is Different Dimension HO3. Loving Kimono-over from Essie lately! Gosh, not sure I could pick a favorite! Anything vampy with shimmer would do, though. This is an impossible task. I'll just go with whatever I think of first, and that's a 3-way tie: Girly Bits' What Happens in Vegas Ends Up on Twitter, Tonic's Rainbowfish and Colors by Llarowe's Lotus.